We’re your total source for all your products’ label, overlay, nameplate, and component needs, and we’re ready to move mountains for you. By streamlining your supply chain, we give you better value and time to market. With hundreds of materials, formats, and properties to choose from, we can fulfill everything from your product ID, display window, and overlay needs to internal/external labels, shielding and adhesive components, packaging and more. Our Preferred Converter relationships let us provide you with the latest materials and technologies before they become widely available; our close work with agencies allows us to prepare your designs to exceed UL, CSA, TUV, and other requirements. 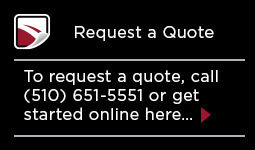 For images and in-depth information about our products, toggle the links below. If you would like to see some actual samples and learn more about how Cellotape can help you with your labeling needs, call 510.651.5551. Using Cellotape as a one-stop-shop for all your label needs can help you maximize your product’s appeal, cost, and time to market. We help you create the right overlay for your product, one that will impress your customers and maximize function, while offering dramatic advantages over your competition. Our overlays offer lower cost, faster time to market, and improved durability over conventional sheet metal panels. With our overlays, you can use special finishes, dual surface printing, doming, embossing/debossing, and special inks and colors. Our In-Mold Decoration process can help you create 3D and backlit effects, protect graphics from abrasion and corrosion, and even incorporate shielding using conductive ink. IMD requires fewer manufacturing steps, fewer component parts, and lets you change colors without changing tools, helping you drive your costs down while delivering a better product. Communicate your identity to your customers, by ensuring the highest levels of fit, finish, color accuracy, and appearance. Radio Frequency Identification (RFID) technology permits wireless, two-way communication between a smart label or tag and a reader. The core of the technology is the “transponder”, usually made of polyester film with a printed or etched antenna embedded with a silicon chip. 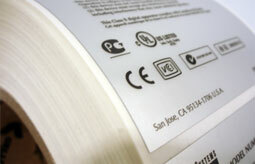 Apply a printed or printable face-stock to the top and you have an RFID tag. Add an adhesive to the bottom and you have an RFID label. 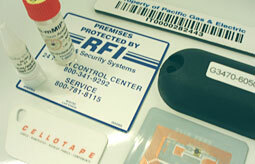 These “smart” tags and labels can then addressed by an RFID reader, also called an “interrogator”. Many factors can influence the selection of the face-stock, transponder, adhesive, and additional features used in the construction of an label or tag. 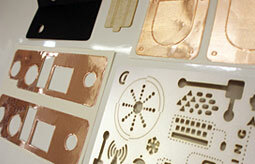 Cellotape specializes in custom RFID constructions to suit your special needs. What surface will the RFID label be applied to? For additonal information on our Smart Products, please visit Cellotape SmartProducts. We offer a very wide range of linear and 2D symbologies, materials, and finishes to ensure readability by your wand or laser scanner. Testing agency requirements can often be very complex. Our broad range of experience and close work with agencies allow us to offer you the right solution for your compliance needs, whether your product is indoors or outdoors. We have developed a large pool of UL-recognized and CSA-accepted constructions, saving you time and money. Thanks to our wide selection of agency-compliant materials and unparalleled focus on quality, we can prepare your designs to exceed UL, CSA, ETL, TUV, VDE, and other requirements. For more information, download our uUL Component-Marking and Labeling Systems PDF document. Cellotape goes beyond graphic applications to provide you with complete solutions. With over 25,000 tools (class A, steel rule, and rotary) and with our digital laser converting capabilities, we can cut complex shapes and meet extremely close tolerances; our capabilities include trimming, laminating, sheeting, and slitting. Our close relationship with material suppliers gives you access to an enormous selection of substrates, foil, foam & rubber, adhesives, inks & coatings, liners, and laminates, to fulfill all your component needs.